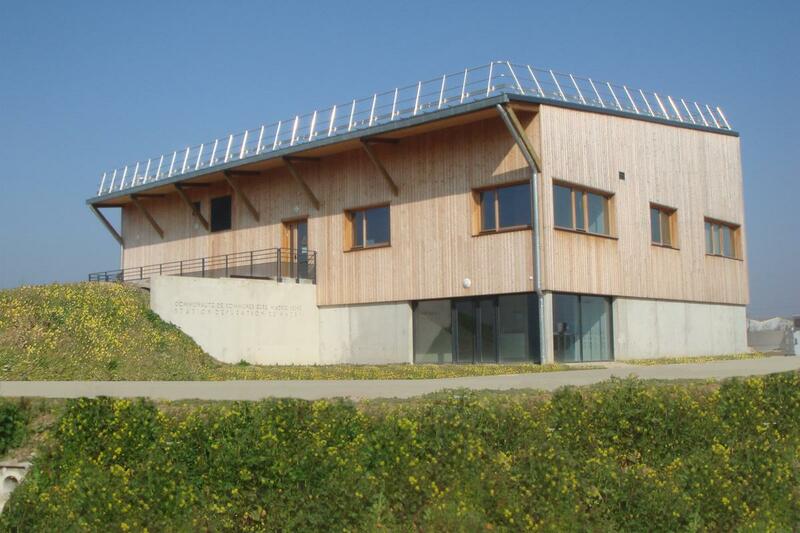 The entire Aubevoye wastewater treatment plant responds to an innovative HQE® approach, proposing a bioclimatic timber frame construction building made of Douglas fir class 4, combined with natural and high-performance materials that allow for a healthy, comfortable construction. perennial, positive energy by an integrated photovoltaic roof at the heart of a remarkable site. The building is oriented on a north-south axis allowing to benefit from an optimal sunshine during the period of the winter and during the summer the heat is dissipated by the ventilation double flux and the devices in roof of brise-soleil. The building incorporates a biogas plant that transforms sludge from the station into biogas and reused as energy, supplying the heat network of public buildings. The whole building is part of a green setting. Landscaping is offered through different landscape units that make up an eco-landscape throughout the site, supporting a walkway integrated into the educational pathway and promoting the development of biodiversity. The environmental character of the building is inseparable from its inclusion in the green box consisting of landscaping, but also from the wetland of the treated water to the point of discharge into the natural environment.